Another from the "wouldja lookit that cover!" files... this is a cover that both gives it all away... and kind of builds you up for what's to come... on the very last page of the issue. When I was building my From Crisis to Crisis-era Superman collec... actually, let's just save that for the discussion portion. On with the spoilery synopsis... you'll never guess what happens this issue! It's a stormy night as we open with Ms. Fenster who is burning the midnight oil at the Lexcorp building. This is in the wake of Lex Luthor's passing and an heir to the Luthor empire has not been named. Among the files, she is able to locate a whole raft of paper written in longhand. What she has found promises to change everything. It's the Silver Banshee... and she's looking for Superman. Clark feigns passing out as Lois chucks the bowl of popcorn at the baddie. Seeing Clark to be certainly not "Super", the Banshee flees crashing through a window. Clark "comes to" and tells Lois he is going to warn Superman about the Banshee. Despite her protests, Clark insists he must go. As he changes clothes, he questions whether or not he should have just told her then and there... but decides there will be a better time and place to do so. He thinks back to the last time he tangled with the Banshee... and recounts a story that I had forgotten about having to do with an old crone. 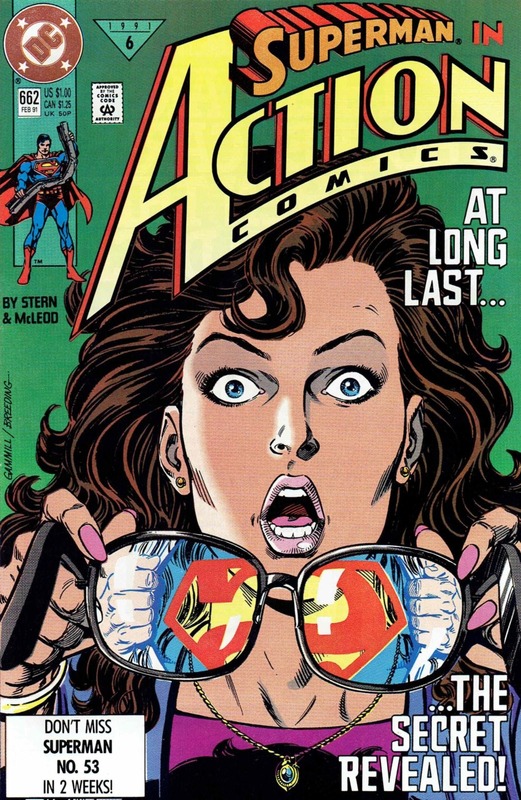 Superman hones his hearing in on the Banshee's frequency and is able to track her to the Daily Planet building where she is terrorizing the overnight staff. The two enter into a struggle, which ends when the Banshee smashes Superman into the street below. She slumps his limp body over her shoulder and trudges away from the scene. From here we briefly revisit Ms. Fenster as she checks in with a lawyery looking individual... it appears Lex Luthor does in fact have a living heir... now they just gotta track him down. Before getting back to the action, we also pop in on Lois Lane (and cat, Elroy) as she chats with her sister Lucy over the phone. The storm causes the power to go out. We rejoin the Banshee at the ruins of St. Christopher's which was also the site of the nightclub "Blaze's". She lays Superman out on something of an alter, and prepares to run him through with the battle axe of the Clan McDougal. She is being instructed by a strange living flame. Superman tosses the axe, knocking down the Blaze-sconce. The Banshee picks it up and makes a last ditch effort toward killing Superman... when she poofs out of existence. It's the doing of the old crone. She and Superman have a brief discussion in which she warns against the threat of Blaze... yeah, no kidding. Some time passes... though, not all that much. Lois is still fumbling with the candles she was going to get the last time we saw her. Clark enters in the darkness, giving her one hell of a fright before they embrace. The lights return and Clark tells her he needs to tell her something. ... and I read it... and I was wildly disappointed. I had anticipated not only the reveal, but "the talk" would occur in this issue. I figured Lois and Clark would really either have it out, or Lois would just start laughing and be all "Yeah... and?" Instead we just end with a pregnant pause... and I'd have to go in search of yet another issue. From here we hop into the Time and Time Again storyline... which I remember enjoying... but, I wouldn't have minded an entire issue to reflect on the reveal. I suppose I'm something of an odd duck, and concede that some may have felt that to be too indulgent. Only having "the reveal" here made it somewhat difficult to prioritize my "shopping list"... it wasn't terribly easy for me to figure out when "the talk" was going to occur (ya know, unless I looked at the [Don't Miss Superman No. 53 in 2 weeks!] note on the cover). I guess that's part of the problem with buying books wayyy after the fact and binging on whatcha bought, you (or I) miss silly little details like that. Anyhoo... please don't take any of this as an indictment on the issue or the era... just some comic-hunting-Chris woes that can't help but to bubble to the surface whenever I think about this issue. Well, it's a fight with the Silver Banshee... and it's fairly decent. I think I would have been more invested in the outcome had the cover not spoiled what was going to occur at some point inside... but that's not the Banshee's fault. Now that I think about it... there just really isn't all that much to say about the "action" segment of the story. It was a decent means to an end, and that's about it. The bits with Clark really stressing over whether or not to tell Lois are what really makes this one for me. I mean, he must have been just itching to tell her... probably from (or around) day one. It was revealed quite early in the Byrne run that Clark harbored feelings for Lois... a fact that everybody seemed to know/pick up on. I see Clark as a guy who wants to share everything about himself with those he loves... and here we actually get to observe some of the mental anguish that goes along with his not being able to. Here we see the final time Clark has to lie to Lois about "informing Superman". We can just see how tired he is of the entire charade. It's appears to be an almost painful endeavor... which I'm really glad they included. This wasn't Clark pretending to be hurt... or crawling into the bushes so he could change clothes... here he actually has to tell Lois he's leaving... at a time when she is scared for both his safety and her own. I mean, the Silver freaking Banshee just made two holes in her apartment! Now Clark is leaving her... such a great way to "end" the "lie". Despite some of my reservations, this is definitely an issue I'd recommend to Superman (and/or Lois) fans to track down. I feel that my initial reading of it did the story a great disservice. I just wanted what the cover promised, and didn't much care about how we were going to get there. In actually looking at this issue with something of a critical eye, I can see that the Banshee bits are... perhaps not integral, but still contextually important to Clark's "coming out". It's been reprinted (as in received a "second print" back around release) and it is included in the relatively recent Lois Lane: A Celebration of 75 Years hardcover (featuring Lois' creepy smile on the cover). Both the single issue and collection are also available digitally.